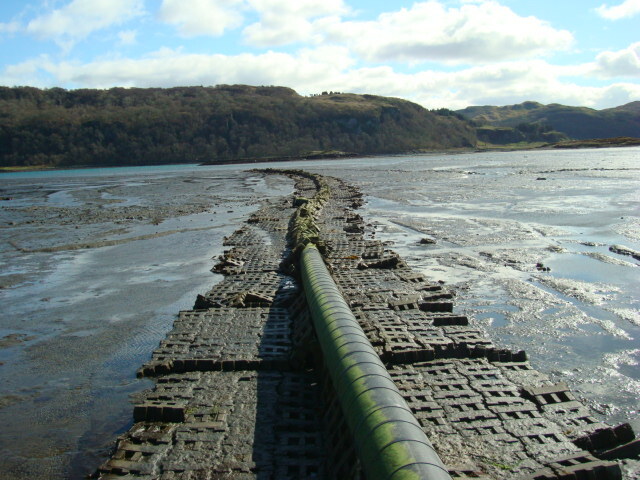 Below are some pictures of the new outflow pipe. It appears to be improperly laid and secured. 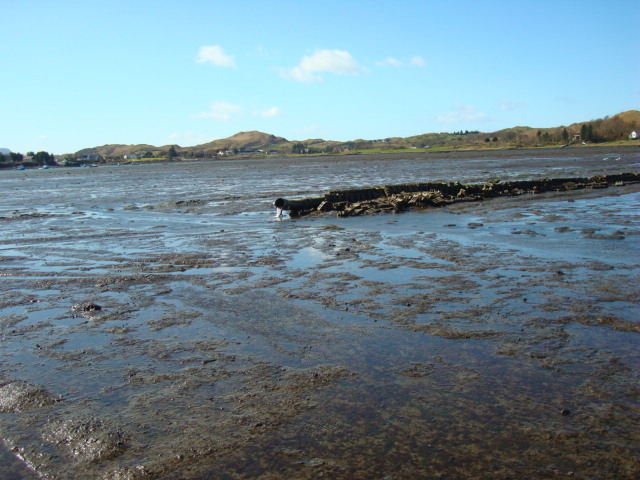 It was 100 meters short of low water last Sunday and discharging onto the mud. I like the barbed wire that has appeared round the treatment plant. Does anyone know when the watch towers are going up? Also, why is there water running out of it? I didn't think any part of the system was up and running. Pub rumour suggests that the system is leaking - Anybody know? The apparent standard of workmanship in these photos does not inspire me to have confidence in the overall scheme. Well that's the last time I go raking about the bay looking for the odd whelk!! Mind, there may be some very strange life forms evolving after those offerings from the pipemouth. New breed of trolls perhaps? You didn't take a petri dish with you Nick? I am pretty sure that is a chain coming out of the pipe . . . I see in today's Oban Times that Islay is the next community scheduled to benefit from a new sewage system from Scottish Water - do you think we should warn them about what to expect? 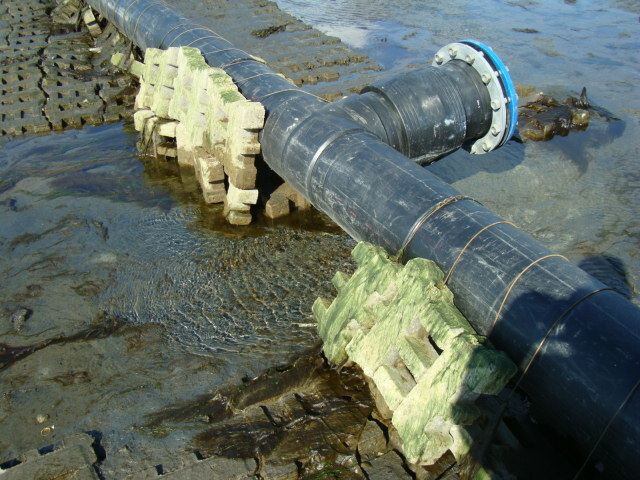 Just thought I might set a few things right - yup its a chain on the end of the outfall (its to pull the pipe into position) and gets removed when are the non-return valves are fitted. Also the system has been live from Balvicar for 3 weeks and the rest of the island for 1 week as performance test are now running. The water that is coming from the pipe is final effluent discharge which far exceeds SEPA recommended levels. I don't think you are in a position to cast any stones. 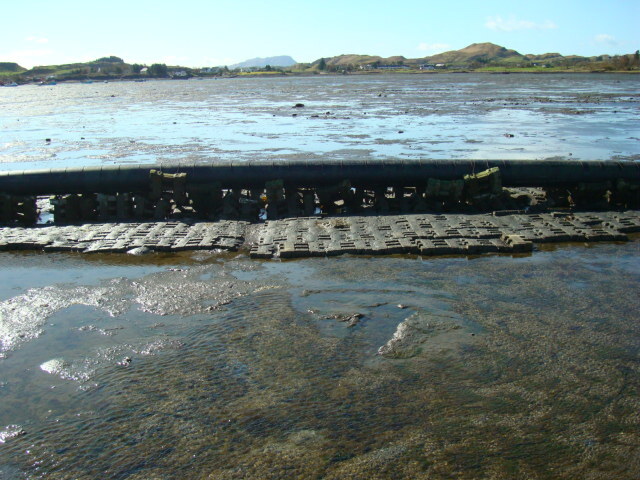 Surely you cannot possibly believe that the current state of the outfall pipe is acceptable - particularly when the original spec called for it to be buried beneath the seabed. Victorian engineers could have managed this - have we lost the ability to do proper engineering? That concrete mat 'solution' is a joke. We are now approaching the moment of truth - will the system work? Rumours are flying that there are already numerous problems. Time will tell, but I for one am not optimistic. As you are the only representative of the contractors brave enough to stick your head over the parapet surely you are also brave enough to admit that not everything has turned out quite as hoped for? Even if it does all work the lasting visual intrusion in the form of the sprawling, ugly main plant, the barbed wire security fence and the unnecessarily large and poorly sited green switchgear cabinets will remain as an act of corporate vandalism in what was a very beautiful area. I could almost feel a degree of sympathy for poor insideman. It is - sincerely - very brave of a rep from BB to brave the parapet. He has obviously had to take a lot of effluent flying around from us concerned locals. Well we've heard/ read what the concerned locals are saying but what do the concerned natives think??? To be honest I see no cause for doom 'n gloom at all and think we should all stop whinging; it just reinforces stereotypes. 1. A small forest is being planted, as I type, around the main plant. In a couple of years the whole patch will be rather pretty. 2. 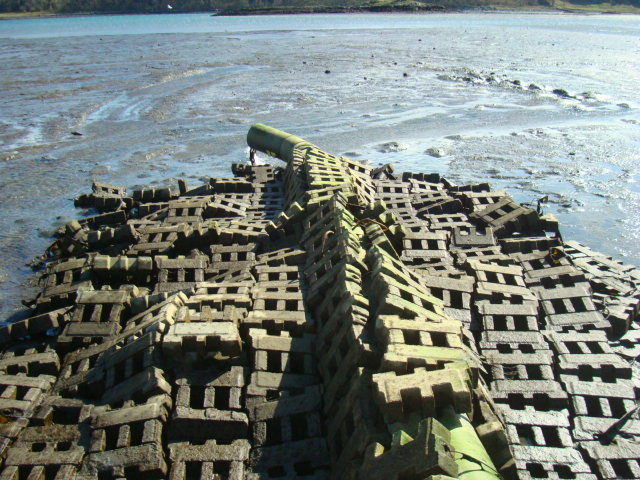 The green boxes are in the process of being replaced with smaller ones, shifted slightly and soon screening will be planted. 3. The outflow pipe is for treated water from the plant and we are assured that its quality will be well above SEPA specs...ie potable. 4. 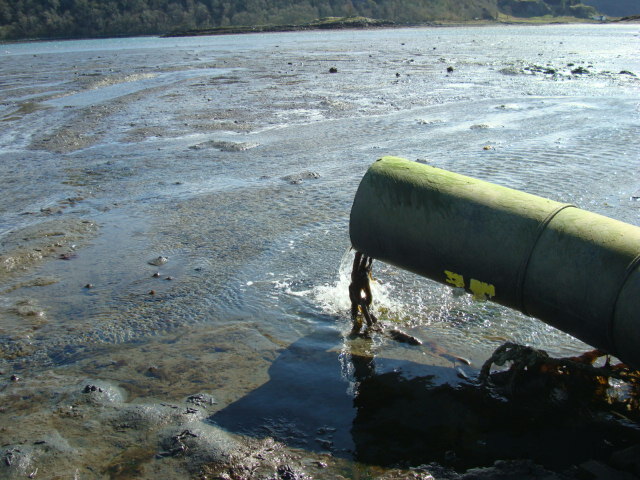 Raw sewage is not directed into the bay through the pipe. 5. It was never in the specs from Scottish Water to bury the pipe; it was merely a "wish" of the CC. 7. Very soon all the exposed earth around the island caused by the diggings is to be sprayed with a mulch containing a wide variety of grass and wild flower seeds; all native. I know I whinged about the scheme recently but I am exercising my female perogative and changing my mind. I am partly persuaded by the fact that the majority of voters in the recent poll are totally happy with BB and the works. As an asiude I trust that "insideman" will be tolerated, despite holding views and expressing opinions and facts counter to the webmaster's views, and not receive the treatment meeted out to many others (my partner being one) on this site who now appear to have banned. Oh, and "canusmellthat"..what's a local, what's a native? I settled here within the last year; what does that make me and do you not want my views? I agree with you in that insideman should be tolerated and indeed, perhaps, could use this forum as a means of communication with the islanders in order to squash the rampant rumours that are presently abroad. Also Canu, rumour, both local and native, suggest that you are native so Canu Shed any light on this? Is the opinion of a local or an incomer any better or worse or of less value than that of a native? How parochial! 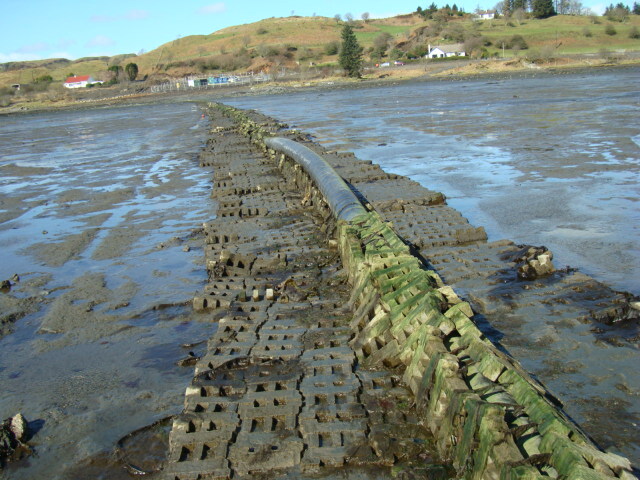 I've just looked at the Oban Times forum - interesting id's on there - and discovered the 'natives' of Arran are revolting over the state of their roads and that the Arran Banner's carried the story that the roads on the island are "ARSED" - Arran's roads slowly eroding down. May I suggest the Seileachan should lead with an article headed "SHITTER"
Seil Householders Irate Through Traumatically Excavated Road! It seems that people around here are confusing the contractor (BB) with the client (Scottish Water). What the client pays for the client gets - so all bitching about green boxes and the sewage treatment works should be addressed to SW and not the contractor. Totally true Insideman. I for one have never blamed Balfour Beattie for the concept, the design or the execution. I think it is a pity that you see any dissatisfaction with the end result as a criticism of Balfour Beattie when, as you say, our argument is very much with Scottish Water. Unfortunately Scottish Water keep their heads down and are a most unresponsive public body, while their poor contractors are out there in the front line. As you say, BB are only doing what the job specs require. I have no personal axe to grind with them, and am sorry if I have ever given you the impression that I blame anyone other than Scottish Water for all the problems (and of course ourselves for not having looked into the whole thing more carefully before the scheme began). I don't think anyone has said that any part of the design or engineering spec is Balfour Beattie's fault, at least not on this forum, and more than a few - me included - have said that they are happy with the attitude and performance of the contractors. My only gripe with Balfour Battie is that you sometimes fail to put a temporary filling in some pretty deep tarmac cuts and that today's ramp signs are not far enough back to give enough warning . . . but that is hardly a major concern. First up I would like to make it clear that 95% of the Isle of Seil residents are good, cheery people who have really been patient with the works on the island/ doorstep/ road to work, and I certainly see your point when it comes to putting everything back in its place. Its just that the 5% vocal minority seem to take it out on BB boys who are desperately trying to finish for your tourist season starting - the last thing we need is people trying to stir things up. BB cannot leave site without the sewage plant working correctly, finishings (reinstatements) to anything that the works have disturbed. BB are not corporate vandals and respect the beauty of the island (especially on a day like today! ), so come forward to the contractors and you'll find them willing to work sit down and answer your questions/ solve problems as much as they can (they are not an endless moneypot so no talk of new driveways, boat slips or returfing your lawn when you live a 1/2mile where the pipeline was!). I hope the residents of Clachan Seil to Balvicar can work with BB to put the island back to (or if not better) the state that it was. Hope that excuses my rants this a.m.
P.S. I'll give you any answers that I can but you really should talk to the bosses at their offices behind Easdale seafoods. P.P.S. The trees are going round the Treatment works on all sides (including the seaward side). P.P.P.S. Somebody did ask for the Xmas tree to be taken down because "we don't like that sort of thing round here"
"(they are not an endless moneypot so no talk of new driveways, boat slips or returfing your lawn when you live a 1/2mile where the pipeline was!)". Does this mean that those of us who do live within 1/2 mile can ask for all those perks? I have generally found that anyone who begins a statement with "to be honest" is usually about to start telling porkies. Also, to have settled anywhere "within the last year" is a wee bit soon to have so very much to say so very loudly. Of course you are entitled to your opinions, it is a free country for the time being anyway. But really, settle down a bit, have a bit of tact. 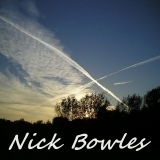 Have a look and a listen to what the real natives of this area feel and think. They donot shout all that loudly for that isnot the way of the folk that are born and bred around this area for generations. They tease each other unmercifully as proven by this forum but they arenot agressive though donot mistake this for weakness. Surely a person can only ever really be a local to a place if they are born and bred there. All others are merely living there no matter how long they have resided in that place and it is a mystery to me why anyone would want to pretend to be local or think the years entitle them to become one. It is a matter of settling happy and peaceably and not bringing the rat race that you were escaping from actually with you so to speak. So "hold your whisht" for a little while, listen. It is better never to become a local thanto become yet another empty vessel. Experience tells me that anyone who begins a statement with "I have generally found" is usually lacking in much experience of life. to have settled anywhere "within the last year" is a wee bit soon to have so very much to say . that isnot the way of the folk that are born and bred around this area for generations. 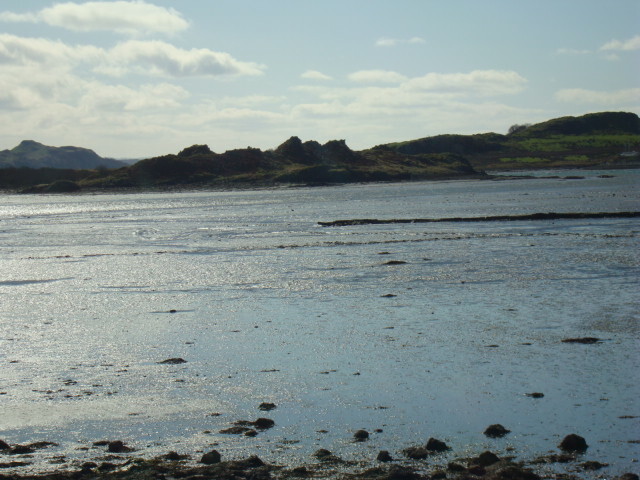 You can count on the fingers of one hand the number of adults living on Seil who were born and bred here. Cheeky but, yes, hold it; this is supposed to be a thread about the treated water outfall pipe. On which subject I feel that the forest currently being planted in and around the treatment works will be an enhancement to our scenery and ecology. As for planting trees right on the roadside, whoever suggested that needs to take a look at how much room there is and then think about the road safety aspects of having trees so close to a busy road. Like I said at the start; leave BB, SW alone..be positive and let them get on with their job. As I said; all this whinging and "I know better" attitude is merely reinforcing our national stereotype.